A UN Police officer says goodbye to members of the Formed Police Unit (FPU) from Nigeria, the last UNMIL uniformed contingent in Liberia. ©UN Photo/Albert Gonzalez Farran. An era of UN peacekeeping ended on Good Friday, as the organization’s fifteen-year old mission in Liberia (UNMIL) closed shop. This follows the termination of the UN missions in Côte d’Ivoire (UNOCI) last summer and that in Haiti (MINUSTAH) in October. All dating back to 2003 or 2004, these were the final examples of a relatively successful series of peace operations launched by the Security Council between 1999 and 2005 that were characterized by (i) fairly large military and police components relative to the territories and populations they served; and (ii) a long-term commitment to enabling peaceful politics in post-war states, including facilitating multiple elections. This generation of missions – which also included those in Sierra Leone and Timor-Leste – were neither easy nor entirely successful. As Kathleen Jennings notes in a useful history of UNMIL, the mission officially started to draw down in 2006-2007, but recurrent security concerns meant that its departure was persistently postponed. The Haitian operation has been overshadowed by the widely-accepted allegation that peacekeepers brought cholera to the country. The run-up to UNOCI’s exit was marred by a series of military mutinies over pay in 2017. Nonetheless, this series of mid-sized missions ultimately had the resources and political support to achieve their goals. UNMIL, Jennings observes, had enough troops and police to provide “a blanket deterrent effect against aggression by armed groups,” although it was cautious in its use of force. 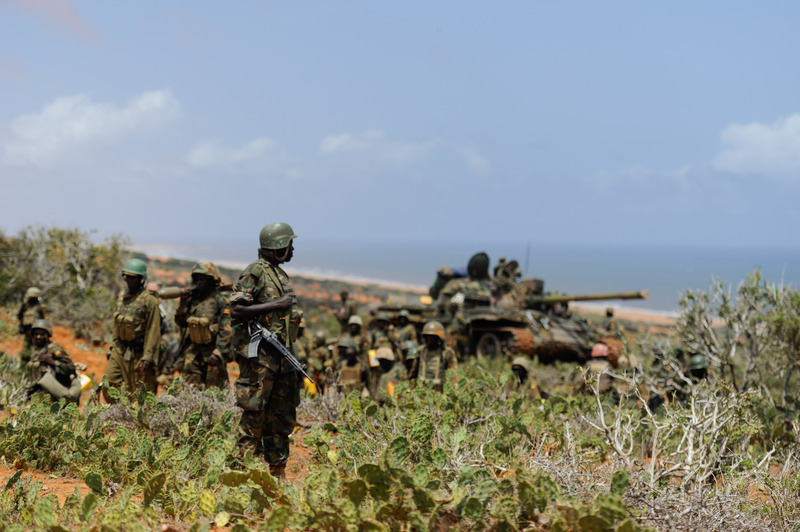 UN officials have long distinguished between this group of missions and a parallel set of cases in which operations have lacked the military heft and political leverage necessary to fulfill their mandates. This second set of missions include those in the Democratic Republic of Congo (MONUSCO) Darfur (UNAMID), South Sudan (UNMISS), Mali (MINUSMA) and the Central African Republic (MINUSCA). In most of these cases, the UN has either lost its political clout or never had much to begin with. And while it has fielded ostensibly sizeable forces, they have never had the numbers or mobility to impose themselves over very large countries. While UN officials have regularly raised their concerns about the purpose and sustainability of these missions with Member States, they are now effectively the organization’s core business. 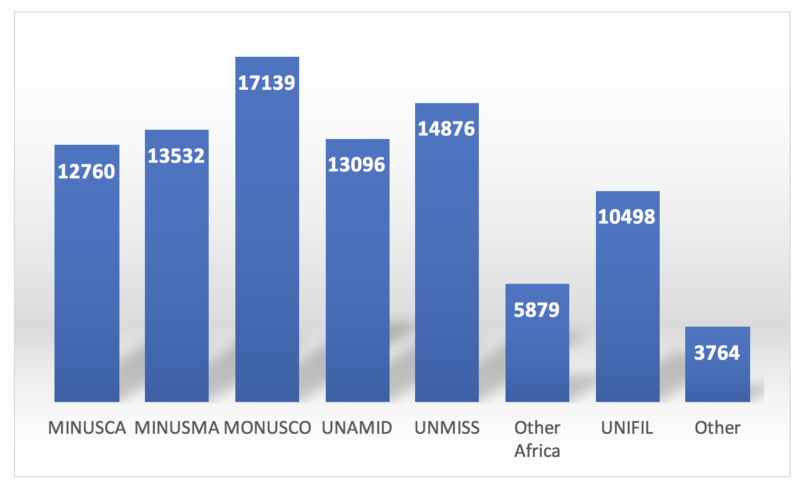 Four in five of all military personnel and police under UN command are now in one of these five missions (see Figure 1), with the greatest number still based in the DRC. The only mission on a similar scale to these “Big 5” missions in Africa is the long running UN Interim Force in Lebanon (UNIFIL). Data from 2017 suggests that four of these five missions face worsening security and humanitarian situation. The exception is UNAMID in Darfur. UNAMID was long a byword for the limitations of blue helmet missions “where there is no peace to keep,” as it has been constantly harassed by local militias and Sudanese armed forces. But its operating environment eased through 2017, largely because the government has suppressed most of the rebel groups in the region. In this context, the Security Council initiated a “reconfiguration” of UNAMID in 2017 that will lead to a significant shrinkage of the force this year. By contrast, most metrics suggest that peacekeepers in Central African Republic (CAR), Democratic Republic of Congo (DRC), Mali and South Sudan will face worsening challenges. The Armed Conflict Location and Event Data (ACLED) project tracks reports of “conflict events” including battles, attacks on civilians, riots and protests. 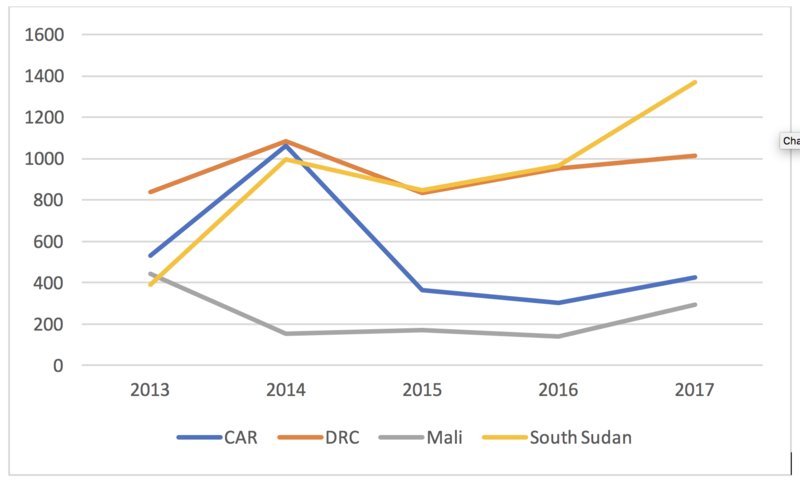 Its database shows an increase in the numbers of such events in CAR, DRC, Mali and South Sudan in 2017 (Figure 2). 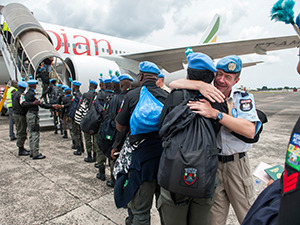 With the closure of MINUSTAH, UNOCI and UNMIL, the focus of UN peacekeeping has shifted decisively towards what the 2015 High-Level Independent Panel on Peace Operations (HIPPO) defined as “conflict management” operations, with a focus on mitigating and containing violence as best they can. Few in the UN welcome this trajectory. 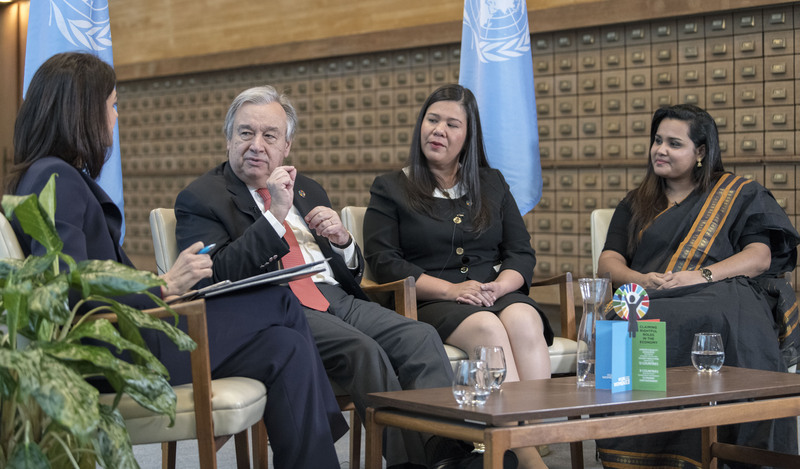 “A peacekeeping operation is not an army, or a counter-terrorist force, or a humanitarian agency,” Secretary-General Antonio Guterres told the Security Council last week. “It is a tool to create the space for a nationally-owned political solution.” While most Council members agree that UN operations are overstretched in theory, they continue to push the organization to take on more conflict management duties in practice. The UN should be rightly proud of its successful tour of duty in Liberia. But the conditions that allowed UNMIL to succeed are partially or totally absent in most of its current missions. It may be too late to turn the clock back. This article is adapted from a fuller survey of the state of peace operations coming soon from the Center on International Cooperation.